Let’s learn how to best utilize the options available to manage your network of customers and vendors. When you have a numerous business contacts, it becomes difficult to distinguish customers from vendors. Filters allow you to view a specific group of contacts. Go to the Contacts module in the sidebar. Click on All Contacts in the top-left corner of the contact list page. Select a filter from the drop down. The contacts that fall under the selected filter will be displayed. A contact may have more than one business locations. For this reason, Zoho Inventory allows you to associate multiple addresses with a contact. Insight: To enter additional addresses for a contact, ensure that you have already entered the billing and shipping address. Click to open a contact. In the Overview page, go to the Address section. 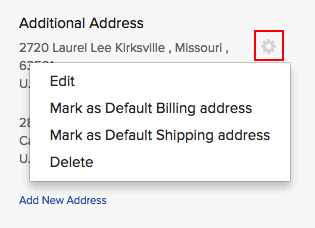 Click the Add New Address option under Additional Address. Enter the new address and click Save. 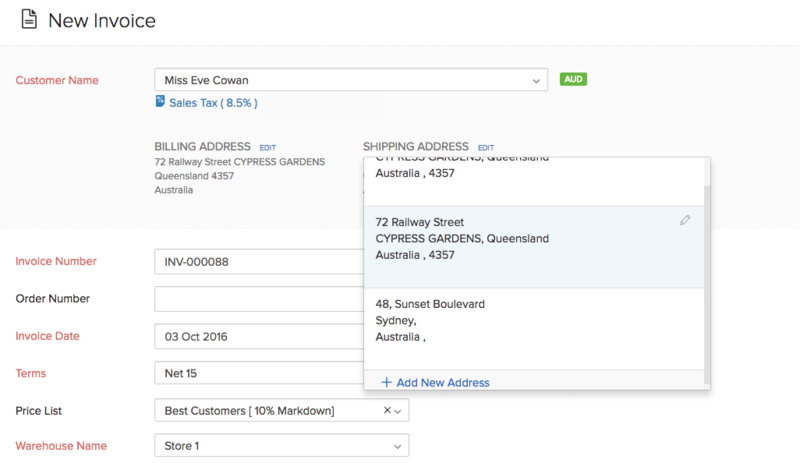 Insight: You can enter up to ten additional addresses for a contact excluding the default billing and shipping addresses. Click to open the preferred contact. Go to the Address section in the contact details page. Click the Gear icon beside one of the addresses listed under Additional Address. Select the Mark as default billing address or Mark as default shipping address option. The default billing/shipping address will be changed and the old address will be moved to the Additional Address section. Click the Gear icon beside one of the listed addresses. Make the necessary changes to the address in the pop-up. Insight: Select the Update the address in all previous transactions option if you wish to update this address in all transactions that have used the old address. This includes draft invoices, sales orders, purchase orders and open bills. Click Save at the bottom of the pop-up. While creating a transaction, the default billing and shipping address will be populated for the chosen contact. However, you can also choose from one of the additional addresses as the billing/shipping address. Click the Edit option next to the billing or shipping address. Select an address from the list of saved addresses for this contact. 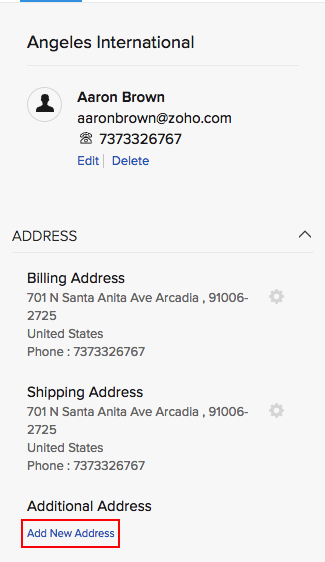 Pro Tip: To add a new address on the fly, scroll down to the end of the address list and click the + Add New Address button. Enter the address and click Save to add and select this address for the contact. Insight: You can change the contact type only if there are no transactions created for the contact. 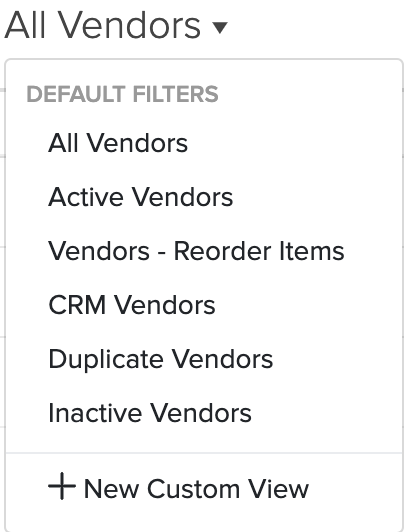 Pro Tip: You can apply the appropriate filter(like Customers, Vendors, etc.) from the top left corner of the module page to narrow down your search. Click the Edit button on the top-right corner of the contact details page. Change the contact type. For example, if the contact is a customer, then change it to a vendor. If you don’t want to delete a contact but would like to shelf the contact for the time being, you can change the contact’s status to inactive. This ensures that the contact exists but cannot be used in transactions. Click to open the contact details page. Click the More button and select Mark as Inactive. This contact will be deactivated and will no longer appear while creating new transactions. Pro Tip: You can make the contact active again by clicking More > Mark as Active. 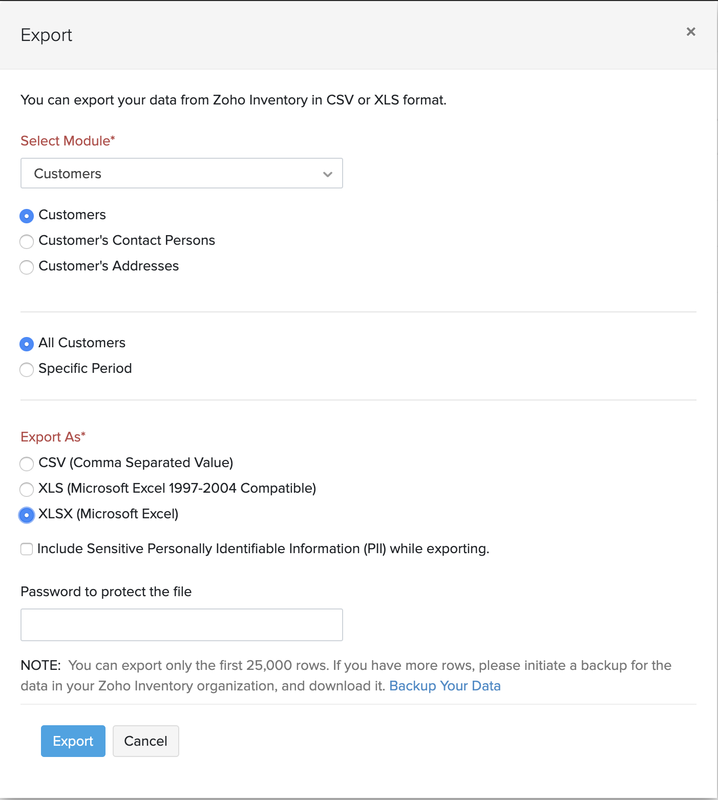 To take a backup of your contact list, you can export them in a file from Zoho Inventory to your computer. Click the Hamburger menu icon in the top-right corner of the module page. Click the Export Customers or Export Vendors option from the drop down. Apply filter if needed. The Custom filter allows you to export the contacts that were created during the selected dates. Choose a format in which the file needs to be exported to your hard drive. CSV or XLS. A copy of your contacts will be saved as a .CSV or .XLS inside your default downloads folder. If a contact has been duplicated, you can merge them with the original one in Zoho Inventory. Insight: The contacts that you choose to merge must be of the same type and must have the same currency. Click the More button to the right top corner. Select the Merge Contacts option from the drop down. Select a Master Contact from the dropdown. Insight: A master contact is the primary contact with which the child contact’s details and associated transactions will be merged. Post merging, the child contact becomes inactive. Do note that you cannot undo the merge. All transactions associated with the child contact will be merged with the master contact and make the child contact inactive. Pro Tip: You can also merge multiple contacts in one go. Documents such as contractual agreements, terms of service etc., can be attached to the relevant contact in Zoho Inventory and used for future reference. Click on the Paperclip icon. Browse the file and select it. The file will be uploaded and attached to the contact. Insight: A maximum of 5 files (not exceeding a size of 5 MB each) can be attached to a contact. On integrating Zoho Inventory with Zoho CRM, you can import your contacts from Zoho CRM into Zoho Inventory. 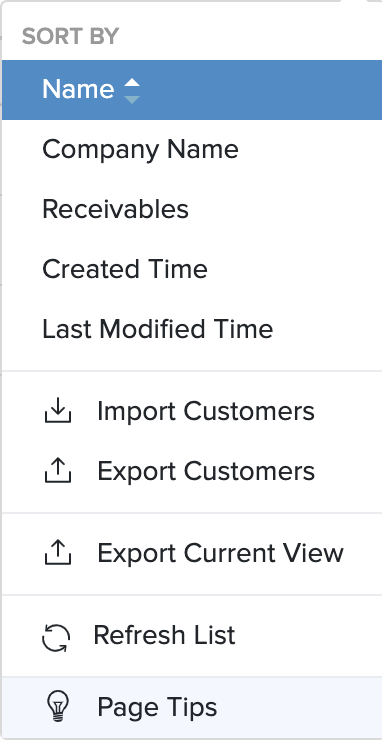 When you modify a contact in Zoho CRM, the automatic sync that takes place once every two hours will normally update the changes in Zoho inventory. Apply the filter CRM Contacts to narrow down your search. Click the More button to the top-right corner. Select the Fetch this contact from Zoho CRM option from the drop down. The contact will be reimported from Zoho CRM and its information will be updated in Zoho Inventory. Some businesses have customers who are also their vendors. For instance, you provide food services for your client who in turn provides accounting services for you. In this case, we can see how a contact is both a customer as well as a vendor. The linking feature in Zoho Inventory . If you have a single contact who is both your customer and vendor, you have to create them as two separate contacts in Zoho Inventory. Click to open a preferred contact. Click More and select the Link to Customer/Vendor option. If the contact is a customer, then you can link it to a vendor and vice-versa. Choose the customer/vendor with whom you want to link the contact. Click Link. Both contacts are now interlinked. Post linking, you can view the payables and receivables in both contact pages. Cloning is the quickest and easiest way to create a new contact from an existing contact. For instance, if you have a customer who is also your vendor, then they’ll both have the same contact information. In such cases, you can first create the customer and then clone it to create the vendor contact, only changing the contact type. Click More and select Clone. The existing contact’s details will be auto-populated. Make the changes where needed. Click Save to create a new contact. Go to the Contacts tab in the sidebar. Pro Tip: You can apply the appropriate filter (Customers, Vendors, etc.) to view the desired list of contacts. Learn more about filtering contacts. Click a contact name to open it. Click the More button and select the Delete option from the drop down. Insight: If the contact has transactions associated with it, you have to delete the transactions and then delete the contact. An easier way to resolve this would be, to deactivate the contact. Pro Tip: When you update the billing address or the shipping address of a contact, you have the choice of updating these changes across all draft orders and transactions. The bulk operation allows you to perform a specific action (merge contacts, mark as inactive or delete contacts) on multiple contacts in one go. Go tot the Contacts module in the sidebar. Click the More Actions button at the top. Select the contacts to be merged by clicking the boxes before their names. Click the More Actions button. Select the Merge option from the drop down. Choose the contact that has to be the Master Contact. Confirm your action and the contacts will be merged as one with the master contact.